Before you select which gold mining stock to buy read our advice how to buy gold stocks. It’s important to understand than with these shares you are not investing into the actual value of metal but merely into companies that are in the business of prospecting and mining for various precious metals. Understanding how to evaluate these companies will help you make the right investment decision. One of the top shares in this particular market you will find today is ABX. This company specializes in mining gold, and they have twenty six mining operations located all around the world. The high market price of precious metals has made many of the gold stocks popular, and one of those that tops the list is EUGD. This company is based in Vancouver, Canada, and is a leader in the industry. For investing in gold you will not find a better stock than AngloGold Ashanti. This stock is traded on five different exchanges, and has shown to be a winner for many investors. One of the most sought after gold stocks is NMC. This company is known as the largest producer of yellow precious metal around the globe, and is a top ten pick for investors in this type of investment mechanism and even for gold investment funds investors. 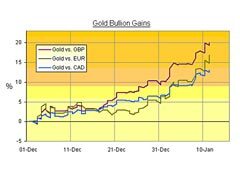 When it comes to gold bullion trading, GFIOF may be an excellent choice. This business produces more than three and a half million oz of this metal every year. KGC is one of the top gold stocks for most investors. This company produces more than two million ounces of this metal each year, and has shown terrific returns for investors in the past. Instead of gold mutual funds, a good choice can be investing in stocks of this company. Their stock has a reputation for low risk and a history of quality for investors. If you are in the market for gold stocks based in China then an excellent choice can be ZIJMF. Started in 2000, this company has been featured in Business Week and can be a sound choice for investment. A good alternative to any gold ETF is an investment in NCMGF stock. This company is the biggest producer in the country of Australia, and one of the top ten anywhere around the globe. Based in Canada, Goldcorp Inc. has a lot to offer investors. As one of the senior precious metals stocks on the market, you will find plenty of reasons why this business is oen of the top ten for investors interested in gold.